USA: Krell founder launches new company – and eco-friendly compact monobloc amp | What Hi-Fi? These have a 19mm opening top and bottom, narrowing to around 12mm in the centre, the expansion of the hot air at the upper opening drawing cool air in at the bottom. 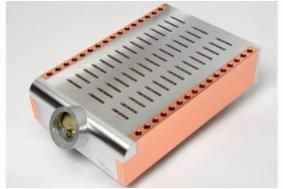 The chassis is machined from a solid billet of aluminium, and the amplifier is assembled from the base so no fasteners are in evidence on the front, back, sides or top-plate. Finishing the design is a prominent power meter inspired by Breguet watches, and bearing D'Agostino's signature. Following soon will be a matching Momentum preamplifier, said to be 'a unique product that combines the functions of a traditional analogue preamplifier with a digital media server'.